Far-out. Groovy. Let's head on down to the disco, daddio. And other mostly-inaccurate slang terms. Days of Wonder has announced a new Ticket to Ride game. This time, it's London in the 1970s. Instead of trains, players will be looking to create routes of the famous double-decker busses to the most iconic locations around town. Today, Days of Wonder announced the release of Ticket to Ride: London, a new, fast-paced version of the well-known board game Ticket to Ride. 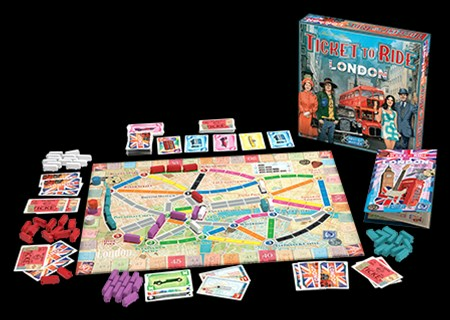 Ticket to Ride: London is a stand-alone game designed for 2 to 4 players and plays in 10 to 15 minutes. It includes 1 board map, 68 plastic buses, 44 Transportation cards, 20 Destination Ticket cards, 1 rule leaflet, 4 Scoring Markers. Ticket to Ride: London is expected to be available in June in Europe and in July in North America at a suggested retail price of $20/20€. In the U.S., the game will be available exclusively at Walmart stores for a limited time.